I LOVE rhubarb. My first taste of rhubarb was from my great grandma, she had a patch in the tiny garden behind her amazingly preserved house full of 70’s decor–I’m talking green shag carpeting, wood paneling, rainbow granny-square afghans, and plastic tortoise-shell beaded curtains. I love the tart, almost berry-like, flavor and the hot pink hue. It’s the perfect plant for pies and crumbles (which is probably why it gained the nickname “pie plant”) and I look forward to the end of winter every year when rhubarb starts showing up at the store. 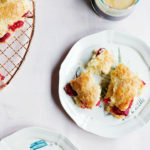 I hope to grow a small patch of rhubarb in our backyard–we actually live in the same city that my great grandma lived in, so I know it will thrive–but until then, I’ll be impatiently scoping out the grocery store for its springtime arrival. 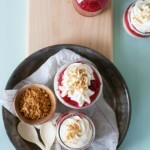 Continuing my effort to add some standards to my recipe repertoire, I wanted this rhubarb crumble to be pretty classic with a buttery, almost shortbread-like topping and absolutely full of tangy, bright rhubarb. The topping has the addition of lemon zest (because I think most buttery things are improved with a little bit of citrus zest) and some flakes of almond for nutty texture. I use cornstarch as my thickener here because I prefer it to flour (I think it can taste floury) or tapioca (it can become too gummy once baked). I suggest 1/2 cup to 2/3 cup of sugar depending on how tart you like your filling. 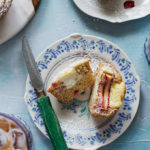 I LOVE tart things, especially when topped with buttery crumble and melting ice cream, but I know several people who have reported that sometimes my desserts are too sour for their taste–adjust according to your preference! You can use a combination of fruits here–shoot for about 2lbs of fruit. 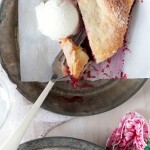 I think berries are always a great compliment to rhubarb. If you use strawberries, add an extra teaspoon of cornstarch as they tend to release a lot of liquid when cooked. 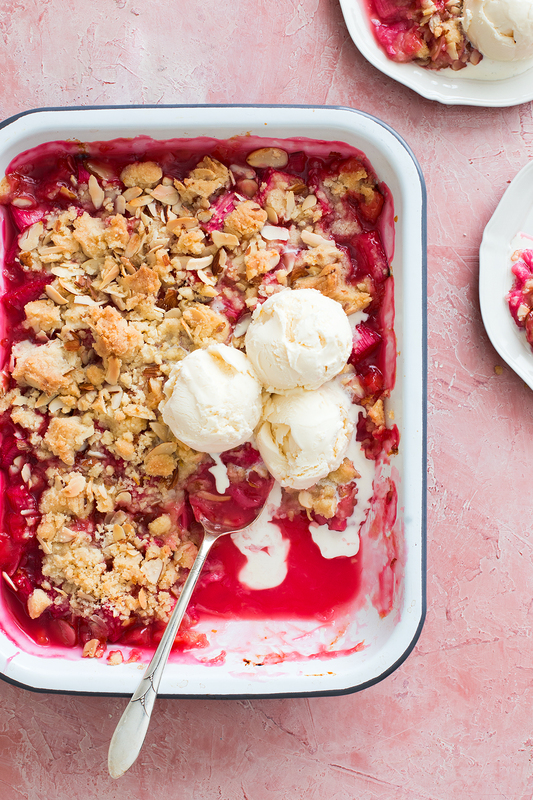 A classic buttery crumble with tart spring rhubarb. In a mixing bowl. Combine the cold butter cubes, flour, sugar, lemon zest, and salt. Pinch the butter into the mixture until incorporated and you can pinch the mixture into clumps--you can also use a pastry blender for this. Add the sliced almonds and toss to combine. Press the crumble mixture into the bottom of the bowl to compact it--this will help you achieve large crumbles and some sandy bits. 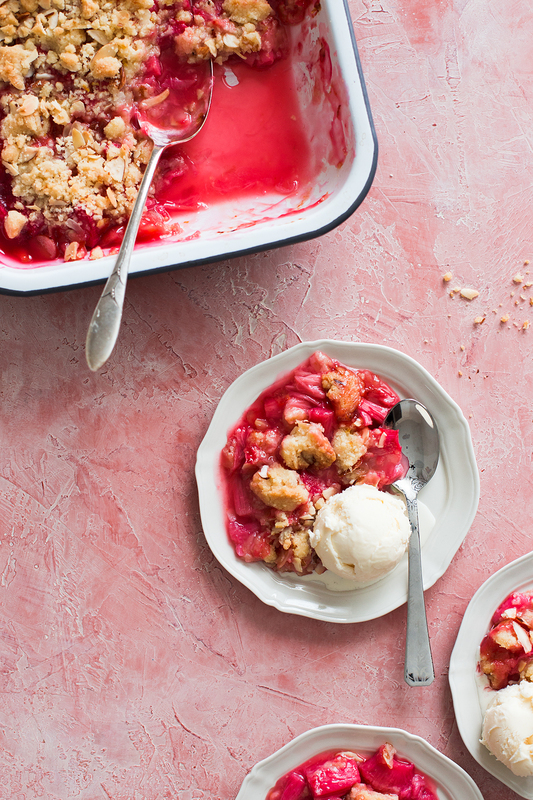 Chill the crumble topping while you prepare the rhubarb. Rinse the rhubarb to remove any dirt and trim the ends and any leafy parts (the leaves are toxic!). Cut the stalks into pieces (I like about 1-inch pieces so they maintain some shape after baking) and toss in a bowl with the sugar, cornstarch lemon juice, and a pinch of salt. Spread in a 9x13-inch baking dish and top with the chilled crumble. Bake the crumble for about 40 minutes, or until the topping is golden brown and the rhubarb is bubbling through the center. Remove from the oven and cool for 10 minutes before serving. Beautiful ! Truly beautiful ! 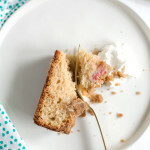 I didn’t like rhubarb much when I was younger, but my husband loved it. So one day I made him a pie, and…what was I thinking?! I can’t for the life of me remember why I didn’t care for it. I love it! I like this recipe because there’s no watering down the tart rhubarb with strawberries, and almonds in the crust sounds magnificent. Thanks! Yes! Glad you changed your mind. 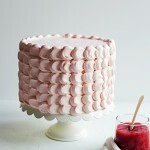 :) I definitely agree, I like rhubarb on its own too.